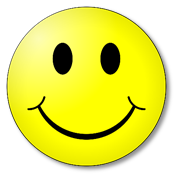 All of us are familiar with that, important part of popular culture, the smiley face that greets us through shopping mall posters, badges, magazine articles and now through our e- mails, making us smile in response. I was fascinated to find out the other day how that cheery, yellow face came about. According to the article I was reading, it originated with one, Harvey Ball in 1964, and was an assignment for an insurance company poster to be displayed in their offices, but I was most interested in the reason why the company wanted such a poster. It was a friendship campaign, firstly to promote happiness in the work place and secondly to allow that feeling to flow though the workers when they answered the telephone, welcomed customers or dealt with problem complaints. As I was absorbing the brilliant work ethic this approach had, I saw a startling resemblance to all of us who love the Lord. We don’t need a smiley face to create a warm, loving feeling towards others, our Heavenly Father has provided us with the most powerful reason to smile ever created, his own radiance, and what is more amazing we can access that radiance just by looking to him and asking him to fill us with that light, He would want us to spread this radiance wherever we go. I think most of us are aware of how powerful a warm smile can be. As I child I heard adults say, “Her smile could light up a room.” How as parents that first wobbly smile from our baby warms our hearts. An intimate smile from a loved one, shared just by two, is very special. A smile can bridge generation gaps. It can eliminate the barrier of language and can create a sense of belonging between strangers. When we know how our smiles can be transformed into radiant ones that can spread his light to others, it is so important to stay close to the source, so our smiles don’t become mechanical or forced, lacking in warmth. This can be so important within the community we live in or even in our church fellowship so visitors are enveloped in light and can be drawn to the real source of this light, Jesus Christ. 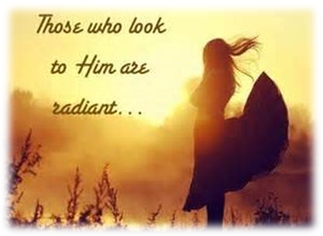 So what a wonderful way for us to start our days, if we look up, seek the Lord’s face, ask for that radiant smile to adorn our faces so we spread light/ joy / acceptance/ understanding/ warmth/love to all we come across in our daily walk. The smile comes so naturally when the lord Jesus is in our hearts ! He creates a glow that others notice. I feel so blessed to know Him! We had a heavy dew this morning and as I looked outside the trees were covered in jewels, sparkling and radiating the morning light. God’s smile. Thanks Jo . Your smile comes through your words from Him..